How many EDC slipjoint folders? Discussion in 'Edged Tools' started by A K Church, Nov 8, 2018.
cmgoat, Odie, mtngunr and 6 others like this. Stockman everyday! Along with a wave, and a Kershaw flipper! I like knives. Nightflyer, deckard313, cmgoat and 12 others like this. Really enjoying -- and have been carrying -- a recently acquired GEC #78 ebony American Jack. Why? It just feels great in my hand and in my pocket. And it's a very capable knife. I would put it's "duty class" (the toughness of work I think it's suited for) at or slightly above that of the Farmer. It feels nicer to handle than the Farmer. I'm not crazy about single-blade lockbacks. I prefer the strength and simplicity of a fixed blade, or the great utility of a SAK, or the elegance of a classic slipjoint. Nightflyer, deckard313, cmgoat and 8 others like this. I carried stockman-style knives for years, but recently thought I'd try this instead. Cheap knife, but pretty handy; I use the saw quite a bit. Elgatodeacero, Nightflyer, deckard313 and 15 others like this. Nightflyer, deckard313, cmgoat and 10 others like this. I always carry a slip joint in addition to the small fixed blade I wear on my belt. Lately I've been carrying a case stockman and I will still carry that most days but when in the woods I'll be carrying the large rough rider stockman I just got. SAK different ones but nearly everyday. Nightflyer, deckard313, cmgoat and 9 others like this. Case mini Trapper. Sometimes I switch to a Case Copperlock. Elgatodeacero, Nightflyer, deckard313 and 10 others like this. Nightflyer, deckard313, cmgoat and 7 others like this. Since about 1999 a stockman. Started w a med OT on a friends recommendation. Liked the versatility the 3 blades gave. Got a few others since UH, Case, Colonial, new OT, China buck (worse of the lot). Some small, med, and lrg. I like the rounded bolsters better than the more squared off ones. I also carry a sak/ bsa type camp/ or leatherman (something w a can opener). Although, I bought a rr muskrat w Brown bone scales and fluted bolsters a couple weeks ago I've been trying out. Good knife, not as handy as the stockman. A Medium stockman is usually within arms reach. Love the Wharncliffe and spey blades for detailed cuts on fabric, rubber, vinyl, cardboard, and carving. Easy to sharpen to a keen edge. Either that or a SAK Farmer, or camper. steel a way, Nightflyer, deckard313 and 7 others like this. A slipjoint folder has been my "American Express card" for nearly 4 decades....I don't leave home without it! Current rotation includes an SAK Tinker, a Buck canoe knife and a vintage OT Stockman. Victorinox Farmer for a few years now, a Pioneer a year or two before that. Eventually I’d like to get my hands on a GEC Viper in micarta or elk scales. It varies from day to day but usually involves a SAK and a Spyderco. Sometimes a Case Trapper. Elgatodeacero, Nightflyer, deckard313 and 12 others like this. Always, always a GEC in my pocket. Either my #15 Huckleberry Boy's Knife, one of my #77 American Jacks, a #77 Barlow, or a Bullnose. And Always an SAK Walker with a Firefly in place of the toothpick. I also EDC a Kizer Gemini. The Kizer is my work knife. I carry the SAK because I like having a saw and a means to make fire on me at all times. I carry one of the GECs because I' ve had a traditional Jack knife in my pocket every day of my life since the age of six. It's a way of life for me. Elgatodeacero, PaPa K, deckard313 and 10 others like this. SAK, either a Huntsman or a Farmer and a Sodbuster Jr. I used to carry an OT stockman, which still gets pocket time on occasion. cool! I never knew the term for a SAK type folding system. I've got a small imperial that has it. I have a thumb stud linelocker as my everyday carry. I wanted a small and fine blade for those type of tasks. the lock isn't really a issue for those. you do have to pay attention when closing one. particularly small ones where the holding hand has little room. But I've also been bitten by back lockers so i can't say it's unique to this type. SAK and/or Spyderco squeak because legal in NYC. Vic Farmer, Streamlite Microstream and a Bic. Every time I put on my pants. Salm0n, blind & lost, Nightflyer and 11 others like this. deckard313, Nightflyer, cmgoat and 7 others like this. Pretty much all I EDC are slipjoints, usually a medium stockman, sodbuster jr, or a Rough Rider whittler. I really like modern folders, but get tired of carrying them because they’re so obtrusive in my pocket. The only one I’ve really cared for is a Kershaw Leek, because it was small and lightweight. I’ve carried a trapper, sodbuster, or folding hunter in my front pocket for at least 34 years. Only a Case and only Cv. Although I do have a Queen folding hunter I carry a good bit. deckard313, Nightflyer, cmgoat and 8 others like this. My every day carry is a sak farmer and BHK frontier first. Salm0n, Mookietherooster, deckard313 and 10 others like this. SAK = Swiss Army Knife just in case anyone was wondering. You have to pay attention to closing any knife. Most slipjoints won't snap shut until they are past 50% closed. Elgatodeacero, Mookietherooster, deckard313 and 11 others like this. True I should have made that more clear. with my line locker I've got it down to a unconscious action. simply because I use it so often. I use my slipjoint imperial far less. so lack of familiarity makes me more careful. Nightflyer, cmgoat, Odie and 5 others like this. I carry a VIC farme. I like having a saw and awl. I use the bottle opener and can opener on occasion but the blade saw and awl get the most use. I also carry a Leatherman multi-tool juice. deckard313, Nightflyer, cmgoat and 6 others like this. Elgatodeacero, Salm0n, Mookietherooster and 14 others like this. and one of these in the other. Elgatodeacero, Salm0n, Mookietherooster and 10 others like this. Salm0n, deckard313, Nightflyer and 6 others like this. Elgatodeacero, Salm0n, deckard313 and 9 others like this. Typically a Victorinox Farmer or Cadet for me. Which depends on if I want the more robust blade and saw, or a slimmer profile. They're capable knives, legal in more places, and easily reside on my keychain. I like to avoid trouble. deckard313, Nightflyer, cmgoat and 4 others like this. 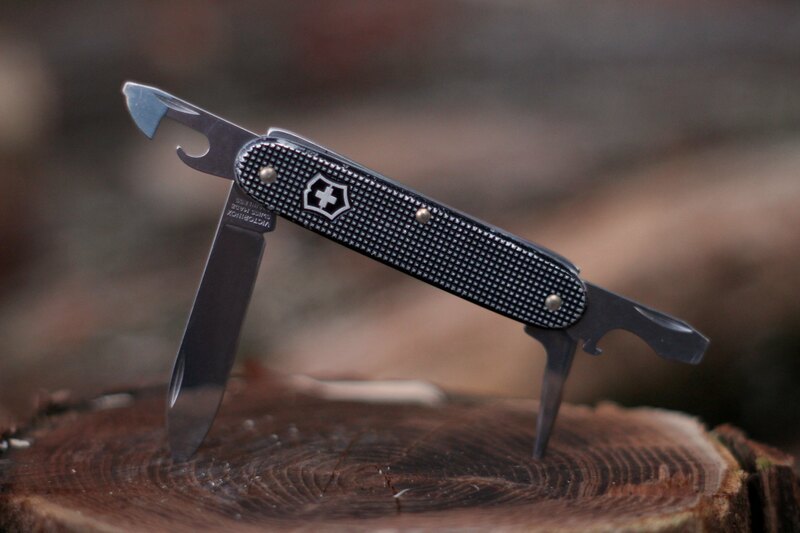 90% Victorinox Fieldmaster, or else it's a Buck stockman. Either way, one of them is always on me. The Fieldmaster has the exact set of tools that I require in an edc. The stockman I carry because I like the platform and it's a very attractive knife - a gentleman's knife. I pretty much always have my half-a-GAK Victorinox Safari Pathfinder with large spearpoint, and combo saw/phillips/slotted/can-bottle-opener blade....mainly carried for the combo blade for all the dig/pry/poke/scrape/twist which would mess up my other knife. Often throw/sub a nice carbon steel classic larger jack knife in pocket, just to get in touch with 1st 30yrs of life when that was pretty much all there was. For real world, nothing beats the handiness of a clip-on/lightweight/one-hand original type Spyderco with all plastic one-piece frame, the few survivors today being the Pacific Salt line, where you never know that almost 4" blade is there, until needed. Then, there is the likely 4"-8" (depending on mood) fixed blade being also carried most times, outside the purview of this topic. I always have a SAK with me. Seldom it is the only knife, but always a SAK. I'm partial to trapper, muskrat skinners and stockman slipjoints if i"M choosing. In days gone by I've been known to pull out a buck 110 and cut up meat at a resturant cause I didn't like the steak knife they brought me. deckard313, Nightflyer, cmgoat and 3 others like this. Old Timer Stockman since the late seventies because I lost my Case stockman prior to that. SAK Super Tinker. I really like the blade shape and the tools are great when needed. I've carried a SAK since I was a kid. I carried a Gerber Applegate Covert for a couple of years, then a Benchmade 710 axis lock for some more years. Fine knives. Then I decided I didn't really need a pocket clip, and went to a SAK Tinker that I've carried for about five years know. The pen blade handles most knife chores. Every now and then, I use one of the other tools. I do much prefer a Phillips to a corkscrew. And it doesn't look "tactical". Nobody even gives a second glance when you pull a SAK. Like many of you, if I'm in the woods I usually carry a Mora or something else too. But I also still have the SAK. A K Church, deckard313, Nightflyer and 3 others like this. All the time. Medium stockman's, copperheads or trappers all at various times. If I only take one knife it's the traditional slip joint. We used to just call them "pocketknives", "folding knives", or "Jack knives". When I first encountered the rather odd term "slip joint knife" about a year ago, I had to look it up because I had no clue what it was. I was imagining some kind of blade with an L shaped slot that opened and locked down or something... I would have never guessed it was supposed to mean the common, spring back, folding pocket knife... It must be some English thing, spread by the internet... You'll still never see me use that crazy term! 62flint, A K Church, Barebow60 and 8 others like this. I have two that I carry 90% of the time, either a Case Large stockman or a Case trapper, both CV. Right now I'm carrying a Muskrat CV because I wanted to show it to someone. Anyway, I always carry a traditional pocket knife. My usual EDC is a Victorinox Swiss Champ. Slipjoint works just fine for EDC and I like the tools. I used to carry a Buck stockman before I got into carrying an SAK once again. Nothing against the stockman, I just found I need the tools on an SAK as opposed to not having them. A K Church, gene stoner, Madwell and 5 others like this. Pics, or it didn't happen...I dont wanna just read what ya got, let's see 'em! A K Church, Madwell, Nightflyer and 1 other person like this. I always carry a SAK, but just about never carry only one knife. A K Church, Madwell, Nightflyer and 2 others like this.